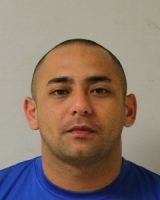 Hawaii Island police are asking for the public’s assistance in locating a 36-year-old Keaʻau man wanted for an outstanding warrant. Saul Keoni Fukunaga is about 5-feet-5-inches, weighing about 130 lbs, with short black hair and brown eyes. He has a tan complexion and has a thin build. Fukunaga has a tattoo of “Puna” on his outer right upper arm. Police warn against approaching Fukunaga and to instead call police at the non-emergency number of (808) 935-3311 or Crime Stoppers islandwide at (808) 961-8300.